Stjepan "Stipe" Mesić (pronounced [stjêpaːn stǐːpe měːsit͡ɕ]; born 24 December 1934) is a Croatian politician who served as the President of Croatia from 2000 to 2010. Before serving two five-year terms as president, he was President of the Executive Council of SR Croatia (1990) after the first multi-party elections, the last President of the Presidency of Yugoslavia (1991) and consequently Secretary General of the Non-Aligned Movement (1991), as well as Speaker of the Croatian Parliament (1992–1994), a judge in Našice and mayor of his hometown of Orahovica. Mesić was a deputy in the Croatian Parliament in the 1960s, and was then absent from politics until 1990 when he joined the Croatian Democratic Union (HDZ), and was named President of the Executive Council (Prime Minister) of the Socialist Republic of Croatia (then still a constituent republic of the SFR Yugoslavia) after HDZ won the elections. His cabinet is, despite holding office before Croatia's independence, considered by the Government of Croatia to have been the first government cabinet of the current Croatian Republic. He later resigned from his post and was appointed to serve as the Socialist Republic of Croatia's membership of the Yugoslav federal presidency where he served first as vice president and then in 1991 as the last President of Yugoslavia before Yugoslavia dissolved. Following the breakup of Yugoslavia and Croatia's independence, Mesić served as Speaker of the Croatian Parliament from 1992 to 1994, when he left HDZ. With several other members of parliament, he formed a new party called Croatian Independent Democrats (HND). In 1997 the majority of HND members, including Mesić, merged into the Croatian People's Party (HNS). After Franjo Tuđman died in December 1999, Mesić won the elections to become the next President of Croatia in February 2000. He was the last Croatian President to serve under a strong semi-presidential system, which foresaw the President as the most powerful official in the government structure and allowed him to appoint and dismiss the Prime Minister and his cabinet. This system was abolished in favor of an incomplete parliamentary system, which retained the direct election of the President but greatly reduced his powers in favor of strengthening the office of Prime Minister. He was re-elected in January 2005 for a second five-year term. Mesić always topped the polls for the most popular politician in Croatia during his two terms. Stjepan Mesić, commonly called "Stipe", was born in Orahovica, Yugoslavia to Josip and Magdalena (née Pernar) Mesić. After his mother died in 1936, his older sister Marija was sent to their uncle Tomo Pernar in France, while Stjepan was put in the care of his grandmother Marija until his father was remarried in 1938 to Mileva Jović, an ethnic Serb who gave birth to Slavko and Jelica. His father joined the Yugoslav Partisans in 1941. The Mesić family spent most of the Second World War in refuges in Mount Papuk and Orahovica when it was occasionally liberated. In 1945, the family took refuge from the final fighting of the war in Hungary, along with 10,000 other refugees, and subsequently settled in Našice, where Josip Mesić became the chairman of the District Council. The family soon moved to Osijek, where Stipe graduated from 4-year elementary school and finished two years of 8-year gymnasium. In 1949, his father was reassigned back to Orahovica, and Stipe continued his education at the gymnasium in Požega. He graduated in 1955 and, as an exemplary student, was admitted to the League of Communists of Yugoslavia. The same year on 17 March, his father died of cancer. Stjepan Mesić continued his studies at the Law Faculty at the University of Zagreb, where he graduated in 1961. That same year, Mesić married Milka Dudunić, of Ukrainian and Serbian ethnic origin from Hrvatska Kostajnica, with whom he has two daughters. After graduation, he worked as an intern at the municipal court in Orahovica and the public attorney's office at Našice. He served his compulsory military service in Bileća and Niš, becoming a reserve officer. After passing the judicial examination, Mesić was appointed a municipal judge, but soon became embroiled in a scandal when he publicly denounced local politicians for using official vehicles for private purposes. He was nearly expelled from the party over the incident and in 1964 he moved to Zagreb to work as a manager for the company Univerzal. In 1966, he ran as an independent candidate in the election for his municipal council, and defeated two other candidates, one from the Communist Party and the other from the Socialist Union of Working People. In 1967, he became the mayor of Orahovica and a member of the Parliament of SR Croatia. In 1967, as mayor, Mesić attempted the building of a private factory in the town, the first private factory in Yugoslavia. However, this was personally denounced by Yugoslav president Josip Broz Tito as an attempt to silently introduce capitalism, which was illegal under the then-existing constitution. In 1967, when a group of Croatian nationalists published Declaration on the Status and Name of the Croatian Literary Language, Mesić publicly denounced it as a diversionary attack against the very foundations of Yugoslavia and called for its authors to be prosecuted by law. However, in the 1970s Mesić supported the nationalist Croatian Spring movement which called for Croatian equality within the Yugoslav Federation on economic, political and cultural levels. The government indicted him for "acts of enemy propaganda". The initial trial lasted three days in which 55 witnesses testified, only five against him, but he was sentenced to 20 years in jail on charges that he was a member of a Croatian terrorist group. He appealed and the trial was prolonged, but in 1975 he was incarcerated for one year and served his sentence at the Stara Gradiška prison. Mesić was elected again in 1990 as a candidate of the Croatian Democratic Union (HDZ) in the first multi-party elections in Croatia after World War II. He became the general secretary of HDZ and later the Prime Minister of Croatia. He served in this post from May to August 1990, when he resigned to become the vice-president of the Socialist Federal Republic of Yugoslavia (SFRY). Presidents rotated annually among the six republics of Yugoslavia. When Mesić's turn came to become president on 15 May 1991, the Serbian incumbent Member Borisav Jović demanded, against all constitutional rules, that an election be held. The members from Serbia and its provinces voted against, and the member from Montenegro abstained, leaving Mesić one vote short of the majority. Under pressure from the international community after the Ten-Day War in Slovenia, Mesić was appointed on 1 July 1991. As Yugoslav President, Mesić also held the position of Secretary General of the Non-Aligned Movement, superseding Jović. In October 1991, at the height of Siege of Dubrovnik, Mesić and Croatian Prime Minister Franjo Gregurić led a relief convoy of forty fishing and tour boats to Dubrovnik. Despite being the head of state of the SFRY, Mesić did not attend many sessions of the collective presidency as it was dominated by four members loyal to Serbia. He was also unable to re-assert control as commander-in-chief of the Yugoslav People's Army, as his orders for them to return to barracks were ignored and they acted independently. On 5 December 1991, Mesić declared his post irrelevant and resigned from the Presidency, returning to Croatia. In a statement to Croatian Parliament, he said: "I think I've accomplished my duty, as Yugoslavia no longer exist[s] anymore". In 1992, he was elected to the Croatian Parliament and became its speaker. In 1994, Mesić left the HDZ to form a new party, the Croatian Independent Democrats (Hrvatski Nezavisni Demokrati, HND). Mesić stated that this decision was motivated by his disagreement with Croatia's policy in Bosnia and Herzegovina at the time, specifically Franjo Tuđman's alleged agreement with Slobodan Milošević in the Karađorđevo to carve up Bosnia and Herzegovina between Croatia and Serbia and the subsequent launch of the Croat–Bosniak War. Mesić left the HDZ some 18 months after the Croat–Bosniak War in Bosnia had started. His departure matches the time of his (and Josip Manolić's) conflict with Gojko Šušak's fraction within HDZ. Moreover, he had visited Široki Brijeg in 1992 in order to dismiss Stjepan Kljujić and install Mate Boban as the president of HDZ BiH, the party's branch in Bosnia and Herzegovina. Mesić later described Boban as a radical nationalist and even "crazy". Mesić criticized the failed policies of privatization during the war and unresolved cases of war profiteering. In 1997 he and a part of the HND membership merged into the liberal Croatian People's Party (HNS), where Mesić became an executive vice-president. Mesić was elected President of the Republic of Croatia in the 2000 election after winning the first round and defeating Dražen Budiša of HSLS in the second round. Mesić ran as the joint candidate of the HNS, HSS, LS and IDS. He received 41% of the vote in the first round and 56% in the second round. After becoming president, he stepped down from membership in the HNS. He heavily criticized former President Franjo Tuđman's policies as "nationalistic and authoritarian", lacking a free media and employing bad economics, while Mesić favored a more liberal approach to opening the Croatian economy to foreign investment. In September 2000 Mesić retired seven Croatian active generals who had written two open letters to the public arguing that the current government administration "is campaigning to criminalize Homeland War and that the Government is accusing and neglecting the Croatian Army". Mesić held that active duty officers could not write public political letters without approval of their Commander-in-Chief. Opposition parties condemned this as a dangerous decision that could harm Croatian national security. Mesić later retired four more generals for similar reasons. As president, Mesić was active in foreign policy. Mesić promoted Croatia's ambition to become a member of the European Union and NATO. He also initiated mutual apologies for possible war crimes with the President of Serbia and Montenegro. After Constitutional amendments in September 2000, he was deprived of most of his roles in domestic policy-making, which instead passed wholly to the Croatian Government and its Premier. Mesić testified at the International Criminal Tribunal for the Former Yugoslavia that implicated the Croatian army in the war in Bosnia and Herzegovina. The right-wing parts of the Croatian public took issue with this, saying that his testimony contained untrue statements and questioned his motives (he was often branded "traitor"), and noting that much of his testimony occurred before his presidency, as an opposition politician. His denunciation of the assassination of Serbian Prime Minister Zoran Djindjic on 12 March 2003 marked a notable thawing of relations with Serbia, and he attended his funeral in Belgrade. He opposed the United States' military campaign against Iraq and Saddam Hussein's regime without gaining United Nations approval or mandate beforehand. Immediately following the invasion of Iraq on 20 March 2003, Mesić deplored that by attacking Iraq, the Bush administration had marginalized UN, induced divisions in EU, damaged relationships with traditional allies, disturbed the foundations of international order and incited a crisis, which could spill over the borders of Iraq. Mesić improved Croatian foreign relations with Libya by exchanging visits with the Libyan leader Muammar al-Gaddafi, contrary to the wishes of U.S. and British diplomacy. The first of Mesić's mandate was not marked with historically crucial events like the Tuđman presidency had been, Croatia's public political orientation shifted away from the HDZ, mostly to the benefit of leftist parties. When the government changed hands in late 2003, problems were expected between the leftist President and a Government with rightist members, but Mesić handled the situation gracefully and there were few notable incidents in this regard. He served his first 5-year term until February 2005. In the 2005 election, Mesić was a candidate supported by eight political parties and won nearly half of the vote, but was denied the absolute majority by a few percent. Mesić faced off with Jadranka Kosor in the run-off election and won. He served his second 5-year term until 2010 when he was superseded by Ivo Josipović. In December 2006, a controversy arose when a video was published showing Mesić during a speech in Australia in the early 1990s, where he said that the Croats "won a victory on April 10th" (when the fascist aligned Independent State of Croatia was formed) "as well as in 1945" (when the communist anti-fascists prevailed and the Socialist Republic of Croatia was formed), as well as that Croatia needed to apologize to no one for the Jasenovac concentration camp (i.e. the WWII Holocaust against Serbs and Jews). Mesić sparked controversy on the issue of the Independent State of Croatia on another occasion during a speech in which he claimed that not all Croats fighting for the Independent State of Croatia were Ustashe supporters and claimed that most were fighting legitimately for Croatian independence. On 1 March 2006 the Civic Assembly of Podgorica, Montenegro's capital, decided to declare Mesić an honorary citizen. The move was heavily criticized and caused significant controversy within Montenegro. On 21 December 2008, President Mesić compared Dodik's policies to those of the late Serbian President Slobodan Milošević at the beginning of the 1990s. "Just as the world failed to recognize Milošević's policy then, it does not recognize Dodik's policy today," he said. Explaining where such a policy could be headed, he added: "If Dodik manages to merge Republika Srpska with Serbia, all Croats concentrated in Herzegovina will want to join Croatia in the same manner, leaving a rump Bosniak country, surrounded by enemies. If this were to occur, that small country would become the refuge of all the world's terrorists." Mesić has been accused by the Croatian Helsinki Committee of obstructing the investigation of war crimes committed by the Yugoslav Partisans during World War II. The Committee also accused Mesić of abusing the commemorations at the Jasenovac concentration camp for political purposes. In 2009, he publicly proposed that all crucifixes be removed from Croatian state offices, provoking a negative reaction from the Catholic Church in Croatia. In 2006, Mesić told the Croatian press that Croatian-French lawyer Ivan Jurasinović should visit the psychiatric clinic at Vrapče, after Jurasinović filed charges for Marin Tomulić against Marko Nikolić and others for attempted murder.[? clarification needed] Jurasinović subsequently launched a civil suit against Mesić which found the president guilty of using his position to attempt to discredit and slander him. Mesić was ordered to compensate Jurasinović 70,000 kunas. In April 2008 Josip Kokić unsuccessfully petitioned the Croatian Constitutional Court to remove the president's legal immunity, so that he could sue him. Ivan Jurasinović launched another appeal to remove the immunity in November 2008. In 2008, former Constitutional Court judge Vice Vukojević launched a case against Mesić, alleging that he embezzled money along with Vladimir Sokolić under the guise of purchasing vehicles for the Croatian Army in 1993. Political scientist and publisher Darko Petričić claimed that Mesić's first campaign in 2000 was funded by the Albanian mafia. In 2009 Mesić filed a lawsuit for defamation but it was decided in Petričić's favor on 29 March 2012. In 2015, a court in Hämeenlinna, Finland, sentenced two executives of Finnish company Patria – executive vice president for Croatia Heiki Hulkonen and representative for Croatia Reiji Niittynen – for bribing Croatian officials in making a €112 million contract with Croatian company Đuro Đaković. Each received a suspended sentence of eight years, eight months in prison and a €300,000 fine. Director of sales, Tuomas Korpi, was acquitted. According to the charge, Patria's managers gained €1.6 million through Hans Wolfgang Riedl and Walter Wolf as mediators, and used this money to bribe Croatia's president Mesić and director of the Đuro Đaković company Bartol Jerković. ^ "41 7.5.2001 Ustav Republike Hrvatske (pročišćeni tekst)". Narodne-novine.nn.hr. Retrieved 17 January 2013. ^ "Unuka Sara je trudna: Stjepan Mesić (79) će postati pradjed". 24 sata. Retrieved 7 November 2013. ^ Robert Bajruši (9 December 2003). "Stjepan Mesić i dalje najpopularniji političar" [Stjepan Mesić still the most popular politician]. Nacional (weekly) (in Croatian). No. 421. Archived from the original on 30 June 2012. Retrieved 15 February 2019. ^ "Najpopularniji Mesić i HDZ, Vladi prosječno trojka". Archived from the original on 22 February 2005. Retrieved 18 November 2007. ^ "Dalmacija vjeruje HDZ-u i Mesiću". Slobodna Dalmacija. 18 March 2007. Archived from the original on 18 March 2007. Retrieved 18 November 2007. ^ "Milka Mesić - deset godina prve dame (Milka Mesić - Ten years of the First Lady)". Večernji list (in Croatian). 1 August 2009. Archived from the original on 30 December 2009. Retrieved 10 January 2010. ^ Stjepan Mesić statement in Latinica (Television production) (in Croatian). Youtube: Croatian Radiotelevision. 1998. Retrieved 10 January 2010. ^ "Svi su bili u zatvorima, osim Josipovića i Milanovića". Slobodna Dalmacija (in Croatian). 24 November 2012. Archived from the original on 30 November 2012. Retrieved 5 August 2013. ^ Grakalić, Dubravko (30 November 2004). "Mesić ili nedaće kreposti". Vjesnik (in Croatian). Archived from the original on 27 September 2007. Retrieved 9 October 2014. ^ "New Crisis Grips Yugoslavia Over Rotation of Leadership", The New York Times, 16 May 1991. ^ "Prva vlada" (in Croatian). hidran.hidra.hr. Archived from the original on 18 October 2015. Retrieved 10 December 2010. ^ Bohlen, Celestine (16 May 1991). "New Crisis Grips Yugoslavia Over Rotation of Leadership". The New York Times. Retrieved 24 May 2010. ^ Tagliabue, John (7 July 1991). "CONFLICT IN YUGOSLAVIA; How Yugoslavs Hold Off Full-Fledged Civil War". The New York Times. Retrieved 24 May 2010. ^ "Peace Flotilla Due to Dock in Dubrovnik : Yugoslavia: Officials are trying to break the federal navy's monthlong blockade of the Croatian port". Los Angeles Times. Retrieved 7 November 2017. ^ "BIOGRAFIJA STIPE MESIĆA (2): Strah od Tuđmanovih muha". Zurnal.info. Retrieved 17 January 2013. ^ "Životopisi predsjedničkih kandidata". hrt.hr (in Croatian). Croatian Radiotelevision. Archived from the original on 18 October 2015. Retrieved 6 March 2012. ^ "Serbian PM assassinated". timesofmalta.com. 13 March 2003. Retrieved 17 January 2013. ^ Eduard Šoštarić (17 October 2005). "Mesićeva podrška UN-u blokira ulazak Hrvatske u NATO" [Mesić's support to the UN blocks Croatia's NATO accesssion]. Nacional (in Croatian). Archived from the original on 30 June 2012. Retrieved 30 June 2012. ^ Plamenko Cvitić (30 April 2004). "Following Blair's visit to Libya, Mesić insisting on trade with that country". Nacional (weekly). Archived from the original on 25 July 2012. Retrieved 25 July 2012. ^ "Ekskluzivno - stari govor Stipe Mesića: Pobijedili smo 10. travnja! - Vijesti". Index.hr. 9 December 2006. Archived from the original on 6 January 2007. Retrieved 15 February 2016. ^ "Stipe Mesic: Croatians were not fascists". YouTube. 18 December 2006. Retrieved 17 January 2013. ^ Hajrudin Somun (21 December 2008). "Balkan rhetoric, but not only rhetoric". Today's Zaman. Archived from the original on 18 October 2015. Retrieved 5 August 2013. ^ "Mesic wants no religious symbols in state offices". Archived from the original on 26 August 2009. Retrieved 5 September 2009. ^ "tportal.hr". Daily.tportal.hr. Retrieved 2016-02-15. ^ Constitutional Court will not remove Mesić's immunity, Poslovni.hr; accessed 14 February 2016. ^ "Podignuta kaznena prijava protiv Mesića". Metro-portal.hr. 2008-05-20. Retrieved 2016-02-15. ^ "Sud: Darko Petričić nije oklevetao Stjepana Mesića". Slobodna Dalmacija. Retrieved 17 January 2013. ^ "Sudac je oslobodio Petričića: Mesić mora platiti troškove". 24sata. 29 March 2012. Retrieved 17 January 2013. ^ a b "Finci presudili u slučaju Patria: Mesić i Jerković primili mito" (in Croatian). Hrvatska Radiotelevizija. 16 February 2015. Retrieved 17 February 2015. ^ "Anfragebeantwortung" [Reply to a parliamentary question about the Decoration of Honour] (PDF) (in German). p. 1446. Retrieved 9 April 2017. ^ ""Dekorata e Flamurit", Meta nderon ish-presidentin Stjepan Mesiç". Balkanweb.com. ^ "Mesić - počasni građanin Podgorice". B92.net. 2007-03-01. Retrieved 2016-02-15. ^ "Trogir: Stjepan Mesić za posjeta Trogiru postao njegov počasni građanin - 123Pixsell". Pixsell.hr. 2009-11-14. Retrieved 2016-02-15. ^ "Slobodna Dalmacija > Prijava". Slobodnadalmacija.hr. Retrieved 2016-02-15. ^ "Stjepan Mesić postao počasni građanin Bihaća - Večernji.hr". Vecernji.hr. Retrieved 2016-02-15. ^ "Nagrada Grada Opatije" (PDF). Archived from the original (PDF) on 9 December 2015. Retrieved 15 June 2015. ^ "Месиќ прогласен за почесен граѓанин на Тетово". Archived from the original on 9 November 2012. Retrieved 15 June 2015. 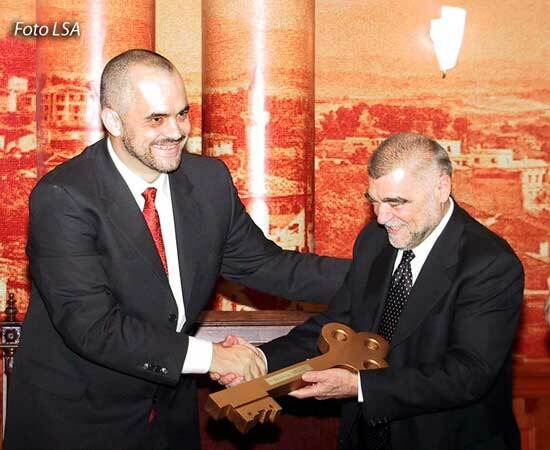 ^ Received a copy of the key of the city of Tirana Archived 5 October 2011 at the Wayback Machine, Tirana.gov.al; accessed 14 February 2016. ^ "TV Klan". Tvklan.al. Archived from the original on 13 May 2013. Retrieved 17 January 2013. Wikimedia Commons has media related to Stjepan Mesić.